Can anything halt the market's bull run? 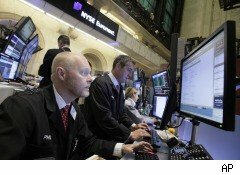 Stocks shrugged off a heavy slate of mixed earnings and economic data -- in addition to the turmoil in Egypt -- to rally nearly 3% last week. Traders had ample opportunity to take some profits -- and yet the market kept rising. With a much quieter week on tap and a key technical hurdle overcome, stocks could very well extend their gains in the sessions ahead. The blue-chip Dow Jones Industrial Average ($INDU) rose 2.3% last week, good for nearly 270 points. The broader S&P 500 ($INX) tacked on 2.7% last week and the tech-heavy Nasdaq Composite ($COMPX) vaulted 3.1%. The major averages have put up gains in excess of 20% since Sept. 1 with nary a hiccup. True, sentiment remains robustly bullish -- a contrarian indicator -- and the market is overbought, but the S&P 500 closed above 1,310 on Friday. By broaching that level of technical resistance, stocks could see more upside ahead, says Ben Willis, director of floor operations at Sunrise Securities. Certainly, a lighter calendar of earnings and economic events will afford traders fewer opportunities to make knee-jerk trades, says Alan Valdez, director of trading operations at DME Securities. Although Dow components Walt Disney (DIS), Cisco Systems (CSCO), Kraft Foods (KFT) and Coca-Cola (KO) will report earnings this week, if recent history is any guide, that should only bolster investor confidence. More than 300 companies in the S&P 500 have posted earnings so far, according to data from Thomson Reuters, and 72% have exceeded Wall Street forecasts. As for econ data, it's a relatively quiet week, says Valdez. We'll get the monthly trade-balance report, a reading on consumer sentiment and another speech by Federal Reserve Chairman Ben Bernanke. Big deal. If anything can upset the market this week, it's likely to be the situation in Egypt, especially if its spreads to the wider region, the veteran New York Stock Exchange (NYX) trader says. For more on Valdez's view from the floor of the NYSE, see the video above.